Low frequency vibrations and large shock inputs can affect the accuracy, repeatability and throughput of precision machines and equipment. Most precision machine tool and measuring machine manufacturers have established allowable vibration specifications for their machines. 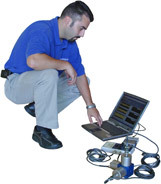 Fabreeka utilizes highly accurate instrumentation to quantify the amplitude and frequency of vibration to make proper vibration control recommendations. Measurements with unique data analysis requirements are performed regularly by our Engineering staff for vibration isolation projects worldwide. Analyses include actual test data outlining the frequency and corresponding amplitude of acceleration, velocity and displacements which may cause potential problems. Analysis of data from vibration measurements enables computer matching of measurements results with Fabreeka’s isolation database. Problem situations are identified, and the appropriate isolators or systems are selected.